The hurricane center issued a hurricane warning and tropical storm warning for South Florida Tuesday. A hurricane warning was issued in South Florida Tuesday as Hurricane Matthew roared toward the southern Bahamas with its dangerous winds early Wednesday, leaving behind widespread damage and human suffering in Haiti's poor, rural southwestern peninsula where the hardest-hit area was cut off by flooding. At least 11 deaths were blamed on the storm during its week-long march across the Caribbean. At 5 a.m., Matthew had top sustained winds of 125 mph and was heading north at 10 mph as it was starting to take aim at the Bahamas. Forecasters reported tropical storm conditions were already spreading over the southeastern Bahamas early Wednesday, with hurricane conditions expected there in coming hours. Forecasters said Matthew could menace Florida toward the end of the week and push its way up the East Coast over the weekend. 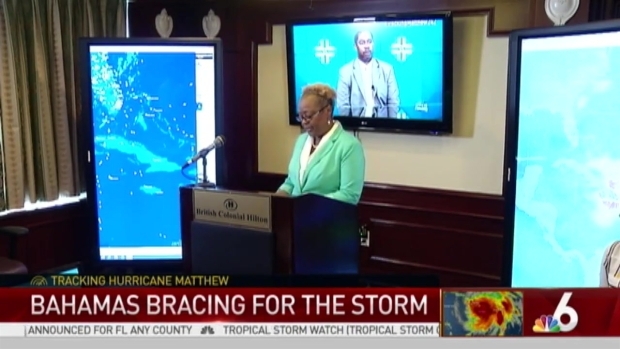 "We do not know yet whether the center of Matthew will actually come ashore in Florida. That's possible," said Rick Knabb, director of the National Hurricane Center. "It also could go to the right and stay farther offshore. The farther offshore it is, the lesser the impacts will be, but the impacts are going to happen no matter what." Residents in the Bahamas were bracing for Hurricane Matthew Tuesday. NBC 6's Jamie Guirola reports from Nassau. Florida Gov. Rick Scott issued a state of emergency for every county in the state on Monday and urged residents along the state's Atlantic Coast to prepare for the possibility of a direct hit. The Red Cross put out a call for volunteers in South Carolina, where a mass evacuation of the coast was planned for Wednesday, and there were states of emergency in Georgia and North Carolina as well. The hurricane watch was upgraded to a hurricane warning Tuesday for Golden Beach in northern Miami-Dade to the Volusia/Brevard County line and includes all of Broward. A tropical storm warning was in effect for the Seven Mile Bridge to Golden Beach. A hurricane warning was in effect for Haiti, the Cuban provinces of Guantanamo, Santiago de Cuba, Holguin, Granma and Las Tunas, the southeastern Bahamas, central Bahamas and northwestern Bahamas. The U.S. National Hurricane Center in Miami said winds had slightly decreased overnight as Matthew dropped from a Category 4 to a still powerful Category 3 storm. But forecasters warned such fluctuations in intensity were to be expected and that Matthew remained a potent and dangerous storm. "The storm will be close to our state and a small deviation from the expected track could mean a catastrophic storm would hit your part of the state," Scott said at a news conference Tuesday in Daytona Beach. Some South Florida stores were already running low on water and other supplies as residents stocked up ahead of Matthew. The hurricane center said Matthew could create dangerous beach conditions along the East Coast later in the week. As of Tuesday evening, no evacuations had been ordered for Miami-Dade, Broward or Monroe Counties. Over 40 combined flights have been cancelled at both Miami International Airport and Fort Lauderdale/Hollywood International Airport. 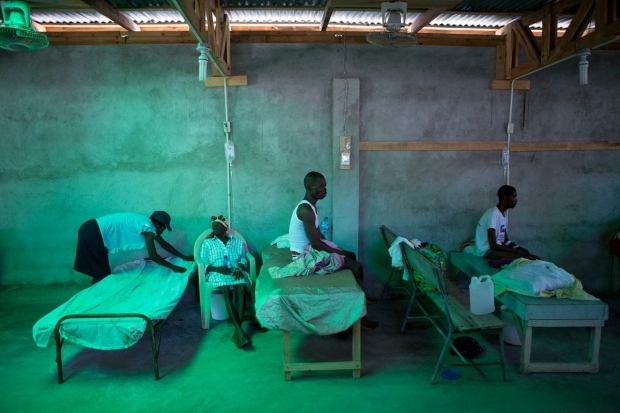 The dangerous Category 4 storm blew ashore around dawn in a corner of Haiti where many people live along the coast in shacks of wood or simple concrete blocks. Two deaths in Haiti were confirmed as of Tuesday afternoon, with four in the Dominican Republic, one in Northeast Colombia and one in the Saint Vincent and the Grenadines islands.But with a key bridge washed out, roads impassable and phone communications down, the western tip of Haiti was isolated and there was no word on dead and injured in that area. 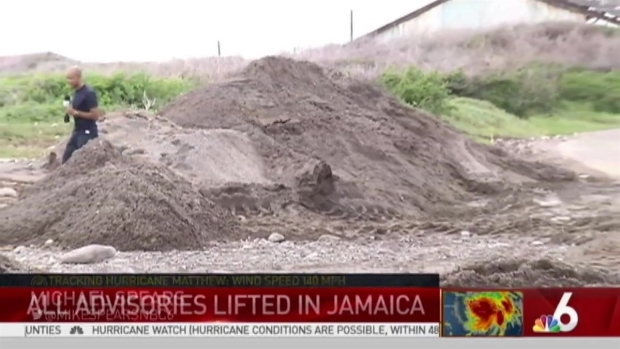 Matthew was inflicting major damage, though the extent was not immediately known, said Marie Alta Jean-Baptiste, director of the country's Civil Protection Agency. "It's much too early to know how bad things are, but we do know there are a lot of houses that have been destroyed or damaged in the south," Jean-Baptiste said. Many streets were flooded or blocked with fallen trees throughout the southwestern peninsula. Rivers surged with muddy water as heavy rain fell. Local radio reported that the water was shoulder high in parts of Les Cayes, near where Matthew came ashore. Haitian authorities had tried to evacuate people from the most vulnerable areas ahead of the storm, but many were reluctant to leave their homes. Some sought shelter only after the worst was already upon them, making their way through debris-strewn streets amid pounding rain. "Many people are now asking for help, but it's too late because there is no way to go evacuate them," said Fonie Pierre, director of Catholic Relief Services for the Les Cayes area, who was huddled in her office with about 20 people. Matthew was expected to bring 15 to 25 inches of rain, and up to 40 inches (100 centimeters) in isolated places, along with up to 10 feet (3 meters) of storm surge and battering waves. The storm was moving along the Windward Passage between Haiti and Jamaica, where it was dumping heavy rain that caused flooding. It was headed for southeastern Cuba and then the Bahamas. The center of the storm was projected to pass about 50 miles northeast of the U.S. naval base at Guantanamo Bay, Cuba. Cuba's government declared a hurricane alert for six eastern provinces, and workers removed traffic lights from poles in the city of Santiago to keep them from falling. As dawn broke, people in the Haitian tourist town of Port Salut described howling winds and big waves slamming the beaches and washing over the coastal road. "The winds are making so many bad noises. We're just doing our best to stay calm," said Jenniflore Desrosiers as she huddled with her family in her fragile cinderblock home, which had sprung numerous leaks from pelting rain. Haiti's civil protection office said a number of coastal towns partially flooded overnight. Landslides and downed trees on roads prevented movement in numerous areas. The few places that were on the electrical grid had apparently lost power, and cellphone service was spotty. All advisories are lifted in Jamaica for Hurricane Matthew. 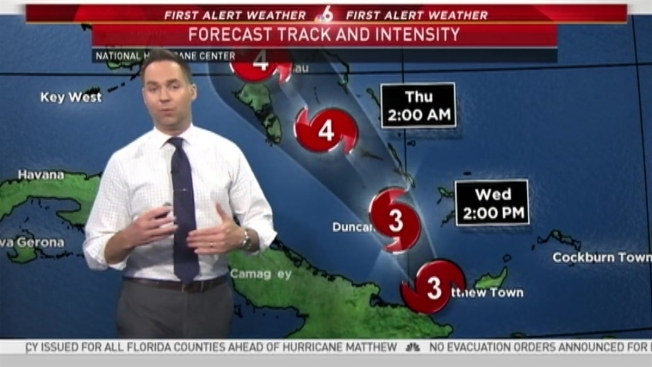 NBC 6's Michael Spears reports from Jamaica. Haitian officials spent Monday trying to persuade shantytown residents to take advantage of shelters being set up, but many refused. "If we lose our things we are not going to get them back!" said Toussaint Laine, an unemployed man who lives with his family in a shack in Tabarre, a suburb of Port-au-Prince, the capital.